• The 6-4 Dolphins, winners of five straight, preventing the Patriots from clinching the division while New England trees still have leaves. Miami has a trustworthy late-game quarterback—finally—in Ryan Tannehill. • The 5-5 Bucs, who will be a game out of first place in the NFC South on Thanksgiving. • The best Dallas team in eons is still hearing footsteps from the Giants (7-3) and 6-3-1 Washington, which is one explosive team. • The two 6-4 teams atop the NFC North—Detroit and Minnesota. They have a two-game lead on the moribund Packers. • Oakland (7-2), which would earn sole possession of the penthouse in the AFC West with a win over Houston tonight in Mexico City. 12:30 p.m. ET (CBS): Minnesota (6-4) at Detroit (6-4). For first place in the NFC North. 3:30 p.m. ET (FOX): Washington (6-3-1) at Dallas (9-1). “We want Dallas!f” the Washington crowd yelled late Sunday night in the rout of Green Bay. You got ’em. 8:30 p.m. ET (NBC): Pittsburgh (5-5) at Indianapolis (5-5). Ben Roethlisberger at Andrew Luck. A nightcap with 70-point potential. Let’s not get too ahead of ourselves. This column’s going to be heavy on the teams we didn’t see coming, and disparate stories I don’t often get to tell. After Sunday’s 14-10 victory in Los Angeles, Ryan Tannehill has now led the Dolphins to four comeback wins this season. In the next six minutes, Tannehill, whose cross to bear has been some awful late-game performances in his four-and-a-half seasons in Miami, hit 12 of 13 throws for 124 yards and two touchdowns. It’s the best he’s ever been, under the circumstances, late in a game since entering the league. It took him just under three minutes to go 77 yards on the first drive, then 95 seconds to go 75 yards and throw a gorgeous laser to a sliding DeVante Parker, in the only place he could have caught the ball, low and outside, near the side of the end zone. A perfect throw, capping two perfect drives. Since getting the coaching job, Adam Gase has trusted Tannehill, and Tannehill has bought in. (Tannehill in their first meeting last winter: “What do you want me to do, coach?”) Gase has responded in kind. Tannehill helps make out the game plan by telling Gase what he likes and what he doesn’t; Gase gives Tannehill authority to change calls on the field without reservation. “I’m really excited where I’m at in this offense,” Tannehill said, sitting on the team bus after the game. It shows: In comeback wins over Buffalo, San Diego and the Rams in this streak, Tannehill had thrown for 264 yards in the last eight minutes of the three fourth quarters, with no turnovers. “To win ball games in the fourth quarter,” Tannehill said, “you’ve got to play with confidence and a full knowledge of the offense. 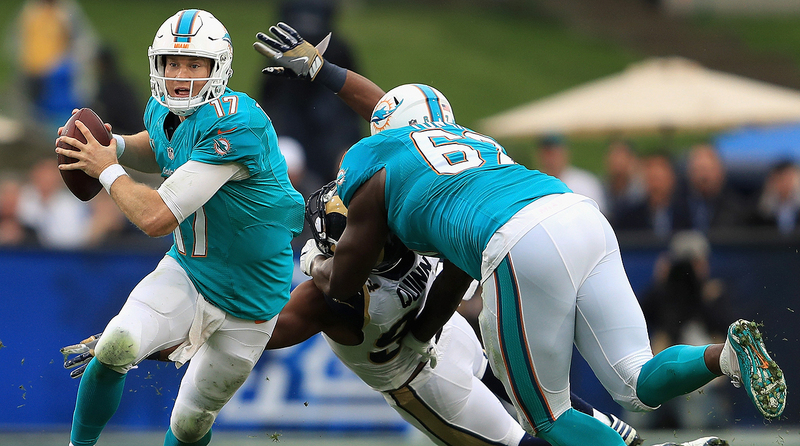 And you better be able to make some big plays.” Finally, Tannehill is doing that, and it looks like the Dolphins’ quarterback of the future is also their quarterback of the present. Won’t it be interesting if, on Jan. 1, in the last game of the season, the New England-at-Miami game has significance in a division that rarely is competitive in Week 17? 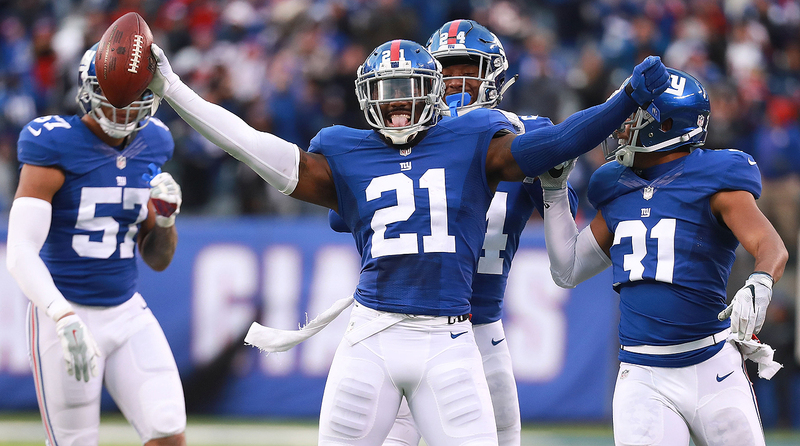 The Giants have won five straight, thanks in part to the play of ball-hawking safety Landon Collins. On the final meaningful play of Giants-Bears on Sunday in the Meadowlands, New York strong safety Landon Collins was right where he was supposed to be: where the ball was going. Chicago trailed 22-16 with 1:19 to play and had the ball at the Giants’ 49. Jay Cutler let fly up the left side for tall Marquess Wilson, while Collins lay back waiting to pounce. Cutler slipped a bit as he threw, and Collins, a former schoolboy baseball star in New Orleans, was waiting for it like a center fielder. The pick ended the game, and was the fourth straight game for Collins with an interception. J.J. Watt is gone for the year. Luke Kuechly might miss some time with a concussion. They’ve combined for the last four Defensive Player of the Year awards. If they’re out—and Kuechly may not be—Collins, a Nick Saban disciple in his second year playing in the box, will be in play for the award. Von Miller, Aaron Donald, Harrison Smith and Bobby Wagner will have something to say about that, but Collins, tied for the league lead with five interceptions (all in his last five games) also has three sacks and 80 tackles, high for a safety. He’s as happy in the box as he is playing center field (happier, actually), though his best play this year was perhaps the NFL’s defensive play of the year—a 44-yard juking and weaving interception return for touchdown in which seven Rams had a chance to tackle him and couldn’t. “But that wasn’t my biggest play,” Collins said from the Meadowlands on Sunday afternoon. “My biggest play was in a high school playoff game. I was held so bad I said to ref, ‘Do you see him holding me? !” And then I chased the ball-carrier from 15 yards behind and caught him, and caused a fumble. I think that was better.” Must have been one heck of a play to beat that pick-six against the Rams. The Giants are 7-3, but it’s been a high-wire 7-3. They don’t run well, and they’ve turned it over way too much (18 times), and Eli Manning has had some cold days. Average game score: 20.4 to 20.0. But the defense gets to the QB from a pressure front, and Collins’ versatility helps a middling secondary. If the Giants win 10 or 11, make the playoffs and Collins continues on his current course, he’ll be in the DPOY race. 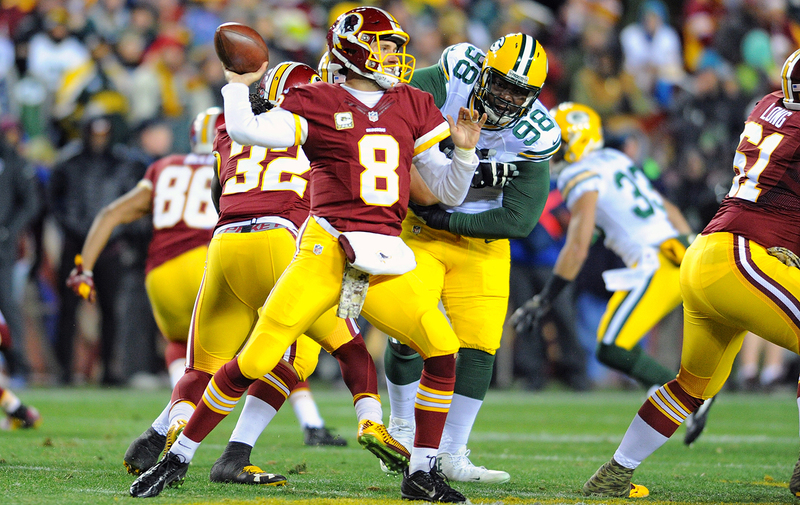 Since the beginning of the 2015 season, Washington is 15-10-1 with Kirk Cousins as the starter. “How you like me now!!! !” So there was this strange Vine (didn’t Vine die?) after Washington’s massacre of the Packers last night. It’s quarterback Kirk Cousins, following one of the best games of his life (21 of 30, 375 yards, three touchdowns, no picks, 145.8 rating), being approached by GM Scot McCloughan, captured by a CSN Mid-Atlantic camera and microphone. “How you like me now!!! How you like me now!! !” Cousins screams, while McCloughan attempts to hug him. Cousins doesn’t return the hug. McCloughan says, “Good job. Good stuff, man,” and they slap hands, and a glaring Cousins then runs his hand over McCloughan’s head. It was … a little weird. There’s never any joy on either man’s face, as you figure there might after you beat the Green Bay Packers decisively. Last year, Cousins threw for 4,166 yards, completed 70 percent of his throws, with 29 touchdowns and 11 interceptions. He was a free agent, and Washington didn’t pay him what he thought he was worth. Cousins signed a one-year, $19.95-million deal with Washington in July. He didn’t seem particularly happy about not getting a long-term deal but stiff-upper-lipped the topic whenever asked about all summer. He told our Albert Breer in training camp, “I’m not going to take things personally,” and “Here I am. The team says they want to see another year. That’s fine.” It didn’t seem fine after his best game of the season late Sunday night. What does it mean? Probably nothing. If Cousins harbors a grudge against his GM, he can join about 300 NFL players who do the same. But it doesn’t mean he won’t end up signing a long contract with Washington, because he’s clearly in the process of proving he deserves what the upper echelon of quarterbacks makes. McCloughan’s a smart personnel guy, working for an owner who won’t let Cousins get away. That’s how I see it. • WHY WASHINGTON IS WORKING: Andy Benoit details how Jay Gruden and his staff are getting it done on both sides of the ball. The Panthers must be smart with Luke Kuechly. One of the saddest sights seen on a football field in 2016, or any year: Luke Kuechly sitting on the field Thursday night, crying. The apparent concussion, his second in 14 months (last year he missed three games with one), must be taken ultra-seriously. In September, I asked Kuechly on my podcast if he’d consider retiring early because of head trauma. “No, no,” Kuechly said. “You love the game, you love everything about it. I've been playing since I was a little kid, and there is good and bad with everything you do. You have to take the good with the stuff that might not be as good. I love the game of football, and I'm going to play as long as I can.” Jenny Vrentas will take up this story more thoroughly in her Tuesday column, but for now I just say that the NFL has made it clear it intends to protect players from themselves with strict concussion guidelines that must be followed with an eager player such as Kuechly. Ben Roethlisberger showed the way last year when he left an eight-point game in the fourth quarter at Seattle when his peripheral vision was damaged severely (temporarily, it turned out), and the Panthers have to be sure that whether Kuechly is as active as Roethlisberger in seeking help, that can’t matter in the protocol treating him. Kuechly is such a football-aholic. Ron Rivera told me a story last week about Kuechly. Last Christmas Eve, Kuechly was in the football offices at Bank of America Stadium watching tape, alone. No other players around. Rivera told him to go home. Kuechly said he had a little more tape to watch, and since his family wasn’t coming in until later, he wanted to stay and watch. Rivera said he was leaving for the night at 6:30, and Kuechly had better be gone then too. At 6:30, Rivera went into the room where Kuechly had been watching tape. “I put my hand up near the bulb, and it was still hot,” Rivera said. “Obviously, he’d just left.” Dedication to one’s craft is a good thing. But let’s be sure the team and the player are doing the right thing for the player. Roman Harper showed me something the other night. Harper, a 33-year-old safety, played eight years for the Saints, then two (2014 and 2015) for Carolina, and now he’s back with the Saints in the twilight of his career. 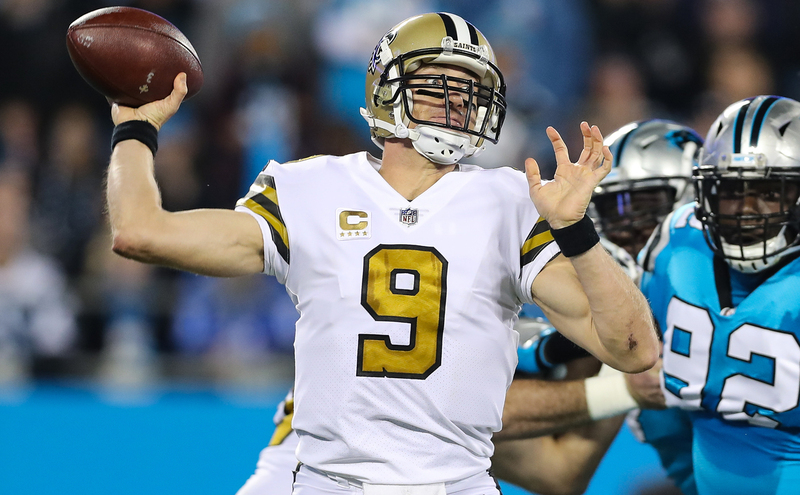 The other night the Panthers were all in blue, courtesy of the NFL’s color rush uniform design, and the Saints all in white. 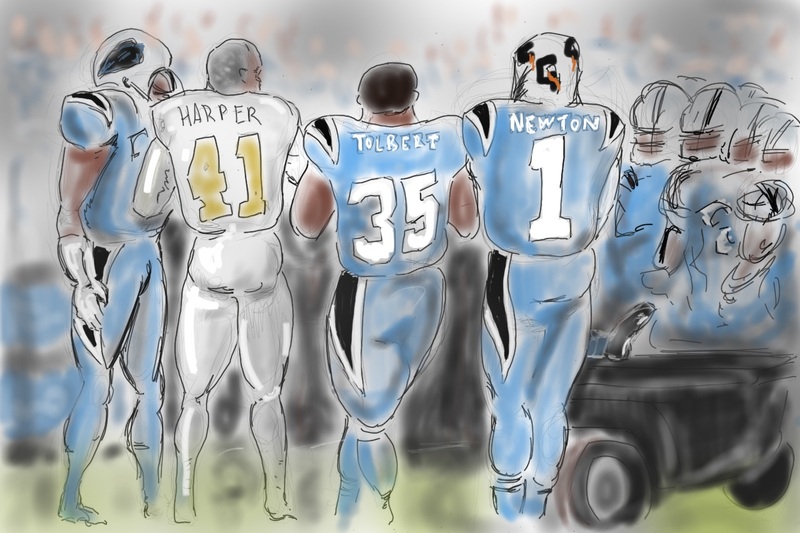 When Kuechly was lying on the field, then sitting up and sobbing, there were several concerned Panthers surrounding their defensive leader … and one Saint. It was Harper, leaning in to say things to Kuechly, and showing his concern. That night Carolina defensive backs coach Steve Wilks, who is close to Harper, sent him an image of the scene, which Harper hadn’t seen, and Wilks texted him: “This is some of the best stuff I’ve ever seen.” I talked to Harper on Friday. “I went out there without my helmet, with sunflower seeds and a spit cup,” he said. “I didn’t even realize it. I just saw my friend out there, and I was so concerned. When I saw him on the ground, I had to go. It’s a special bond, our fraternity of players. Especially when you’ve played with a guy, and you think so highly of him. Man, I love Luke. He’s a great friend of mine. I don’t care what jersey he’s wearing. I guess it was moving to some people, but I didn’t think anything of it.” Harper said he texted with Kuechly after the game, and Kuechly asked him about running back Mark Ingram, who’s been concussed during the game. “That’s Luke, worried about one of our guys,” said Harper. The Chuck Noll Foundation for Brain Injury Research is born. The Steelers announced the donation of $1 million in seed money to kick-start this new foundation that will research brain injuries and the treatment of athletic-related concussions. There’s little question with the league’s $100 million investment in similar brain-trauma research in September that the league and its teams see the need to put money into what’s scaring so many people away from tackle football—and to make the game less risky for those in it now. “Rather than building a statue for Chuck, this is a way to pay tribute to him and leave a lasting legacy that I think he would really appreciate,” said Steelers president Art Rooney II on Friday. “He was interested in science, and in progress, and he was very interested to learn about concussions and their severity.” Noll helped develop the sideline concussion test now used by the league for baseline testing of players. The Steelers, of course, were tarred in the movie “Concussion,” particularly with the post-career care of the late Hall of Fame center Mike Webster, and I asked Rooney if this effort had anything to do with the effects of the movie. “No,” he said. “It’s not so much the movie, but it is a continuing effort to learn about a complicated health issue. There were 22 players who played on all four of our [1970s] Super Bowl teams, and Mike was the only one of the 22 who had such a significant problem. A bunch of guys who played alongside him didn’t have the problem. We’d like to understand why.” I like the fact that not only are respected head-trauma and concussion specialists allied with the Noll group, but also Merril Hoge, whose career was cut short by concussions. SI’s “Football in America” issue is a heck of a read. 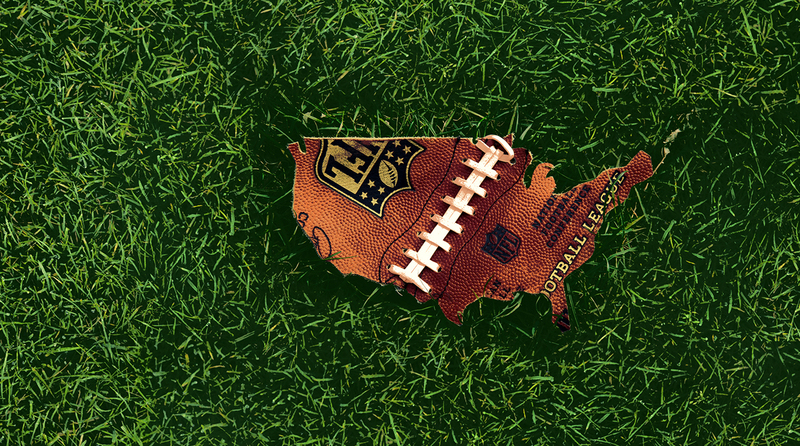 Writers Greg Bishop and Michael McKnight toured the country throughout October to ask hundreds of Americans—from strippers to Jerry Jones to 10-year-old girl players to gamblers to inner-city coaches to Roger Goodell to tailgating fans—how they feel about the state of football. The finished product, edited by Adam Duerson, was entitled Football in America and is a compelling, comprehensive read. I was taken with how many of the interviewees despised Colin Kaepernick’s protest of the anthem and the American flag, and how that’s not going away. I asked Bishop and McKnight about their takeaways from a month deep-diving into the soul of the game. Do not be mad at the missed PATs. It’s actually a very good thing. Kickers missed 12 extra points Sunday, which, as NBC pointed out Sunday night, is four more than they missed for the entire 2014 regular season. That’s the last year team kicked the short PATs, with the ball snapped from two-yard line. Now it’s snapped from the 15-yard line in an attempt to make the kick a more competitive play. Basically, it’s now a 33-yard field goal. And if kickers are missing those regularly, they need to go find a new line of work. The PAT used to be an automatic play—with over 99 percent of them made in each of the last four seasons the kick was a short one. Now the percentage is around 94. At least it’s not a gimme anymore. It’s a remotely competitive play. And five quickies. Still think the Browns will win at least one game—maybe Week 16, home, against San Diego, which will be playing out the string then … Dirk Koetter is on his way to getting a few coach of the year votes, having the Bucs at .500 after 10 weeks, and with wins at Atlanta, at Carolina, and at Kansas City … I can’t see Mike McCarthy being endangered in Green Bay. That’s not a panicky franchise … If Seattle at Dallas is the NFC Championship Game on Jan. 22, there’s a good chance it’ll be a better game than the Super Bowl … It feels very much like Chuck Pagano is saving his job in Indianapolis. 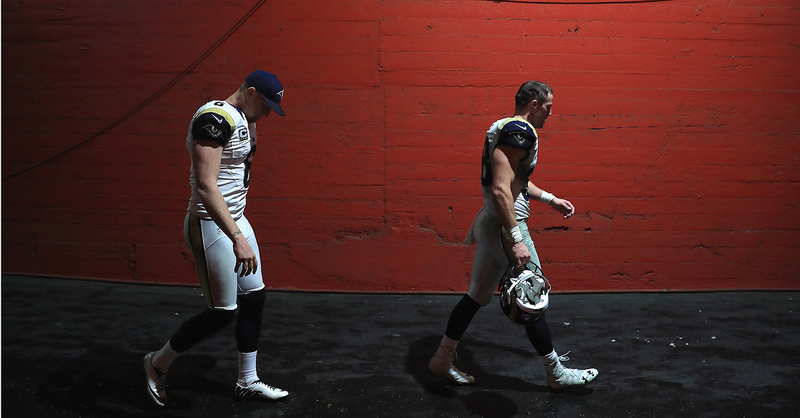 It was a dark day for the Rams after they blew a 10-0 lead late in the fourth quarter to lose to the Dolphins. —Rams defensive end Robert Quinn, after his team blew a 10-0 lead to the the Dolphins and gave up two long scoring drives to lose 14-10. —Referee Walt Anderson, getting the call exactly right when six Titans moved prior to the snap on a first-half faux pas at Indianapolis. —A sign in the crowd in Kalamazoo, Mich., before the Buffalo-Western Michigan football game Saturday, on ESPN’s “College Game Day” show. Western Michigan is 11-0. The Browns are 0-11. For what that’s worth. Truth in promotion: I recorded this conversation, about 31 minutes with Romo, on the last day of Dallas training camp in Oxnard, Calif. He got injured eight days later, and we figured we’d take the pod out of mothballs when he got back into the lineup. Last week, after a now-healthy Romo emotionally ceded the job to Dak Prescott, we decided to run the podcast now, having no idea when he might play. It’s interesting, particularly the stuff about taking less money to sign with Dallas out of college, and the role Sean Payton played in that (huge). —ESPN’s Charles Woodson, on the network’s pregame show Sunday, on the remarks by Tony Romo ceding the quarterback job to Dak Prescott last Tuesday. 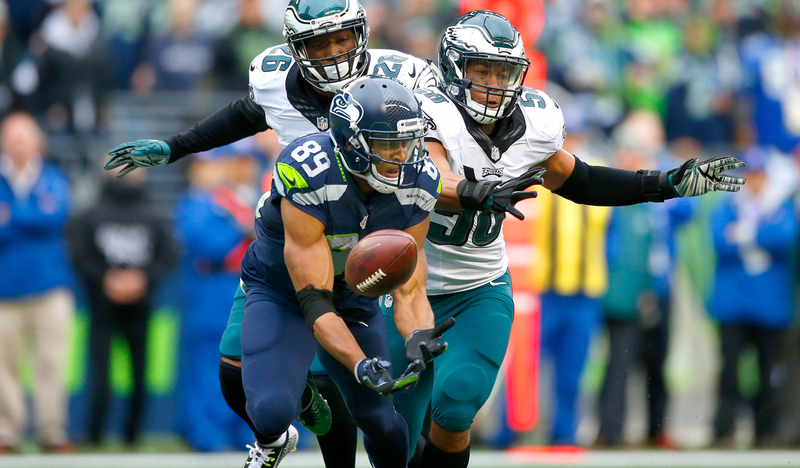 Doug Baldwin and the Seahawks have ripped off three straight wins and have a three-game cushion in the NFC West race. Doug Baldwin, wide receiver/quarterback, Seattle. Key rule point here: A quarterback under center is not an eligible receiver; a quarterback in the shotgun is eligible. So when Baldwin came from the left flank around the backside of Wilson on Sunday against Philadelphia, Wilson was able to leak out for a pass … and he did, and he wasn’t covered at first, and he was open long enough for Baldwin to loft a perfect 15-yard touchdown pass to Wilson at the left pylon. Oh, and Baldwin added four catches for 104 yards. Seattle 26, Philadelphia 15. Month after month, game after game, Baldwin doesn’t get the A.J. Green/Antonio Brown/Jordy Nelson hype, but Seattle is 7-2-1, and only Russell Wilson is more important to that offense. Tom Brady, quarterback, New England. Playing for the first time on the West Coast against the team he grew up idolizing—he once told me he’d hustle home after school on autumn Thursdays to see if Sports Illustrated had any Niners stories that week—the 39-year-old Brady looked like the 25-year-old Brady. Twice he made impossible recoveries out of trouble in the backfield to throw touchdown passes, and he finished 24 of 40 for 280 yards, four TDs, no picks and a 114.6 rating. (Lousy rating for him this year, his second-worst in six games.) For the year, he’s a 70 percent passer with 16 touchdowns and one interception. Ridiculous. Jameis Winston, quarterback, Tampa Bay. The Chiefs were 4-0 at home entering Sunday, but there was no question who the better team, and the better quarterback, was at Arrowhead. Winston (24 of 39, 331 yards, one touchdown, no picks, 97.3 rating) made some huge throws in a 19-17 win, including a third-and-three dart to Mike Evans with 2:11 left, enabling Tampa Bay to virtually run out the clock in a very quiet stadium that normally is never that quiet. The top of the 2015 draft (1: Winston, 2: Marcus Mariota) is looking pretty great. To date in 2016: 43 touchdowns, 18 picks. Luke Kuechly, middle linebacker, Carolina. If not for a needless block in the back from a rookie cornerback, Kuechly would have had an 88-yard touchdown return of a blocked field goal to add to his NFL Week 11-high 14 tackles in Carolina’s season-saving 23-20 win over New Orleans. Of course his game ended with Kuechly on the ground, weeping, after being concussed—his second apparent serious concussion in the last two seasons. One can only hope he’s fine—whether he plays the rest of the season or not—because he’s such an instinctive, natural talent. Cordarrelle Patterson, kick-returner/wide receiver, Minnesota. I do not believe as a rule it’s smart to take kicks out of the end zone in this new world of getting the ball at the 25-yard line on touchbacks. But I do not coach Patterson. Good thing. He took the opening kick of the second half four yards deep in his end zone, made two speed-cuts, faked two Cardinals out of their shoes and scored. The 104-yard return catapulted the Vikings to a win they had to have. Jeff Locke, punter, Minnesota. Standing at his goal line with 2:33 left, Locke had a big job to do. The Vikes led 30-24, and they needed a big kick to pin the Cardinals, who had only one timeout left. A big punt they got. Locke massacred the ball; the 72-yard kick landed at the Cards’ 13-yard line, and the Minnesota defense did the rest, and the Vikings finished the day where they started—tied for the NFC North lead with Detroit at 6-4. For the day, Locke punted four times for a 56.3-yard average. Adam Gase, head coach, Miami. In the last month, more than once Gase has preached to his team, “Ignore success.” And certainly that’s not the reason why the Dolphins have won five straight, nor the reason why Ryan Tannehill looks like the long-term keeper in south Florida, nor the reason why Miami’s come back twice on the West Coast to win two games that looked lost. Gase has handled this team superbly through a 6-4 start. Sen’Derrick Marks, defensive tackle, Jacksonville. With 2:34 left, down by four, and Detroit with a fourth-and-two at the Jaguars 46, the Lions lined up as though to run a play. No one in the place thought they’d run it, though; this was obviously a try-to-draw-them-offside deal by Detroit quarterback Matthew Stafford … and it worked. Marks leaped offside. Instead of the Lions taking a delay and then punting to try to give Jacksonville a long field to work with, Marks’ offside gave Detroit a first down. And Jacksonville didn’t get the ball back until there were only 22 seconds left. Ballgame. Incredibly bad play by a smart veteran. Danielle Hunter, Everson Griffen and Brian Robison, defensive linemen, Minnesota. The Vikings needed a monster game from the defense to stop a four-game losing streak, with Arizona’s capable offense coming to Minneapolis. How’s this for a monster game from these three mainstays of the defensive front: three sacks, 12 quarterback hits and a total beatdown of Arizona quarterback Carson Palmer. In fact, Palmer faced significant pressure or was hit on more dropbacks than when he was clean Sunday, and that was a huge factor in the Vikings’ 30-24 victory. The right combination up front—a combo of youth (Hunter) and veteran wiles (Griffen and Robison)—won’t have much time to rest on laurels: The 6-4 Vikings play at the 6-4 Lions at 12:30 p.m. ET Thursday for the NFC North lead. The key number for Drew Brees is 107. Drew Brees, the Saints’ 37-year-old quarterback, sometime gets 107 needles stuck in him, all over his body, preparing to play a football game. When I met with him last Tuesday at 5:45 a.m. to drive to work for an NBC video story, he told me a couple of things I never knew. The Texans and Raiders play in Mexico City tonight. Each team has played nine games so far. Houston has not scored 28 points in any of its nine games this year. Oakland has scored 28 points or more in seven of its nine games this year. The first penalty of 2016 called on Carolina linebacker Luke Kuechly, a very ticky-tack holding call Thursday night against New Orleans, came midway through the 40th quarter of his season. Michigan/Michigan State/Ohio State/Penn State 224, Rutgers 0. 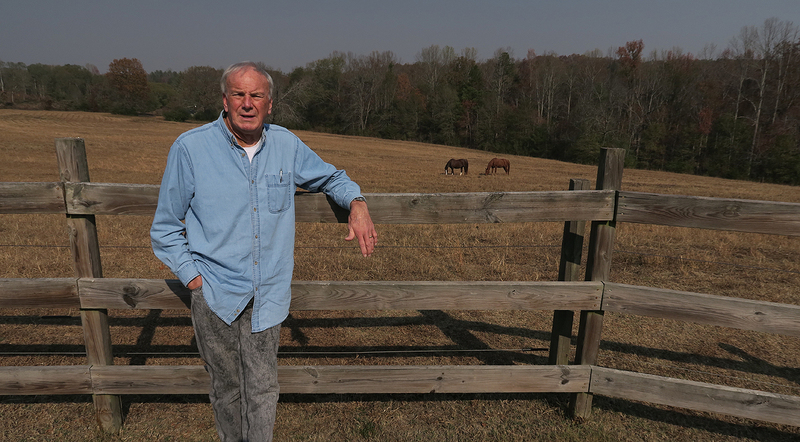 Former NFL coach Sam Wyche, on his property in Pickens, S.C.
That story will be on the site Thursday morning, and I hope you’ll spend a few Thanksgiving minutes reading and sharing a story about a man who will be more thankful this holiday than during any other one in his 71 years on earth. Anyway … you get insulated spending a lot of time on the coasts, as this recent election showed. And when I landed in Charlotte on Tuesday, I smelled smoke. I didn’t think anything of it. On Wednesday morning, I got up and immediately looked up the weather for Pickens. S.C., which is where Wyche lives and where I was visiting him. “Smoky,” the forecast said. I’d never seen that before. So I clicked on the site of the Charlotte Observer and saw there were major fires in western North Carolina. Wyche lives 122 miles west-southwest of Charlotte, and the fires were up near the Blue Ridge Mountains, maybe 40 miles north of him as the crow flies. When I got to Pickens, it was noticeably smoky, and both of us coughed some when outside his home. By Sunday, the fires were still a major issue. They covered about 13,000 acres and were only 40 percent contained. As we’ve seen all over the country, we just haven’t had enough rain to tamp down the hazards for these huge fires. Before we get to this week’s selection, a quick note. 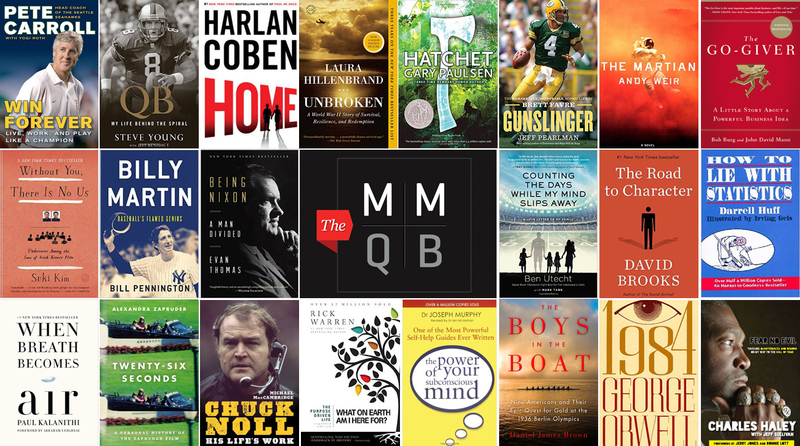 If you’ve been enjoying this section, please check out The MMQB Holiday Gift Guide: Books. It’s a comprehensive look at all the “Night Table” recommendations that have appeared in this space all season—with picks from Andrew Luck, Steve Smith Sr., Adam Gase, Pete Carroll, Dan Quinn and Julius Thomas, just to name a few—and also includes a handful of my favorite books too. Good place to start your holiday shopping. You can purchase “A Gentleman in Moscow” here. Photos like this one, above the entrance to the Saints’ football facility from the players’ locker room, are pretty common around the league. Tom Coughlin did it a different way when he became the Jaguars’ first coach in 1995: He drew a line between the locker room and the practice field, calling it the “Concentration Line,” and telling players that once they crossed that, football thoughts and only football thoughts would take over. PUT THE TEAM FIRST is a big Sean Payton thing, as it is with most coaches. 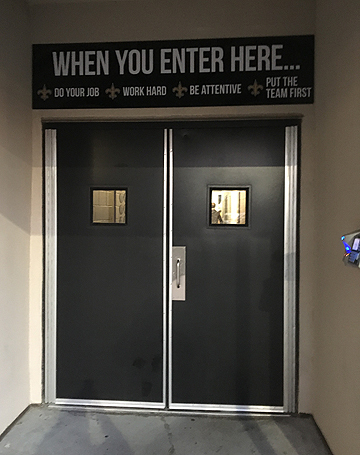 The Saints have a security portal to the right of the door, and players have to put their fingers on a fingerprint-reader to be allowed entry. That’s the ultimate personal key for everyone in the organization. Methinks the brilliant coach doth protest too much. This week’s guest: Dallas quarterback Tony Romo. I recorded the conversation with Romo eight days before he was injured in August, intending to use it when we rolled out the podcast series in early September. Then we thought we’d hold it till he started playing. After his eloquent statement last Tuesday abdicating his throne and throwing his support behind Dak Prescott, it just seems like the right time to run the Romo chat. Question is: Will it happen again—and will it happen in Dallas or elsewhere? 1. Vikings G Alex Boone. The Vikings offense had a difficult time gaining yards against Arizona, but Boone’s performance was a bright spot. Boone’s run-blocking grade was third among all guards in Week 11, and he didn’t allow a hit or hurry on quarterback Sam Bradford on 34 pass-blocking snaps. 2. Chiefs OT Mitchell Schwartz. Schwartz is routinely a solid contributor at right tackle but played his best game of the year in the Chiefs’ loss to the Buccaneers. Schwartz didn’t allow a single hit or pressure on quarterback Alex Smith on 32 pass-blocking snaps. 3. Patriots DT Alan Branch. Branch is large and hard to move at the point of attack. Against the 49ers, Branch had two run stops in addition to clogging the line of scrimmage. He also added an impressive three quarterback hurries on only 14 pass-rush snaps. Go here to access Pro Football Focus grades on every player. 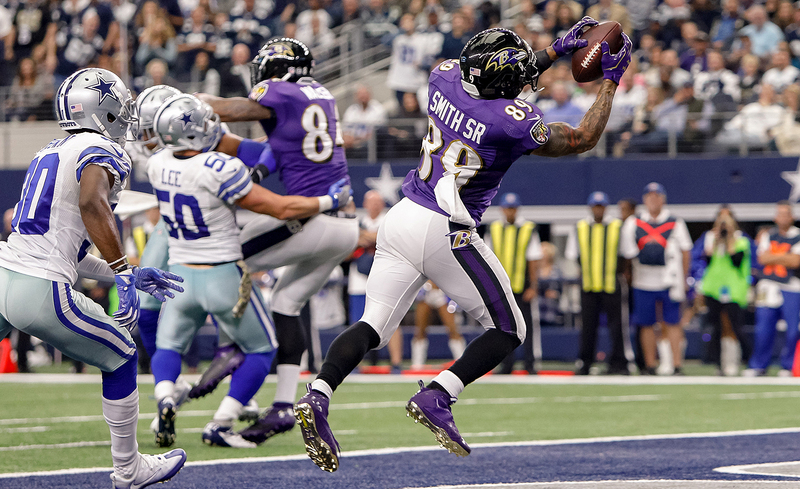 Steve Smith Sr. is the 14th player in NFL history with at least 1,000 career receptions. a. Steve Smith, 37, has wrung just about every ounce of ability out of a 16-year career. On Sunday he passed the 1,000-catch mark by snagging a ball across the middle in traffic—just perfect. He now is 13th all-time in receptions, with 1,005, catches, and eighth all-time in receiving yards, with 14,448.
b. Best guesses for Tony Romo’s 2017 landing spot: Broncos, Bears, Jets, Cardinals—certainly not in that order, because we can’t know who will be most bullish on Romo. c. Most fun fact of the weekend: Bears GM Ryan Pace was a senior defensive end and captain at Eastern Illinois in 1999, when Tony Romo was a freshman quarterback on half-scholarship to EIU. So now Pace will have to decide whether the guy he knew as a college benchwarmer should be in the mix for his 2017 quarterback job in Chicago. e. Come on: seven missed PATs before halftime of the early games Sunday, and 12 misses or blocks for the day. f. You watch that first Baltimore drive of the day at Dallas, when the Ravens ran it down the Cowboys’ throat for a Terrance West rushing touchdown, and you see the tremendous impact All-Pro guard Marshal Yanda has on everything Baltimore does offensively. h. I still don’t know how good the Giants are, but I do know they’ve got the kind of defense that will make them a tough out in January. j. “Uneven” is about the nicest word I can use to describe the 116-passing-yard debut of the first pick in the draft, Jared Goff, for the Rams on Sunday. 2. I think A.J. Green being out with a torn hamstring with six games left and the Bengals 3-6-1 basically qualifies as the end of the five-year playoff streak in Cincinnati. • Miami at home. Dolphins entered the Coliseum 5-4, and on a four-game winning streak. • at New Orleans. Saints are 4-6 and just okay on defense, so this would qualify as “pretty easy,” except in the last two games at home, New Orleans beat Seattle and lost to Denver on that fluky two-point PAT return. • at New England, quite possibly the best team in football. • Atlanta at home. Falcons have a two-game lead in the AFC South and are the highest-scoring team in football. Five games. The elementary ones are at Drew Brees and against a team on a four-game winning streak. The other three are against division leaders, two on the road—the highest-scoring team in football, Tom Brady, and the division powerhouse in the loudest place in football. Man, what would a tough schedule look like? The ’85 Bears five weeks in a row? 4. I think Tyler Dunne of Bleacher Report, one of the young stars in our business, has a great story on the mysterious Aaron Rodgers. It includes these amazing details: A source said he has not spoken to his family since December 2014; Christmas gifts for Rodgers were mailed back to the family; the family was told it was not welcome in Green Bay anymore. As the source said: “He put himself on an island where he has no family. And you wonder why he did can’t do his job like he used to.” Amazing piece by Dunne. 5. I think, whether you think the personal stuff is getting in the way of football for Rodgers, these numbers are unthinkable: Pro Football Focus after 10 weeks had Rodgers as the most inaccurate quarterback in the NFL on throws 20 yards and deeper. That is absolutely stunning for one of the best deep-ball throwers in the game. And what makes this even more surprising is that Rodgers is second in the league in time taken before passing. Only Tyrod Taylor has had more time to throw than Rodgers. 6. I think this story on the logic of Mike Tomlin often going for two after touchdowns is missing one important element. And it’s the fact that if you’ve got a very good quarterback/decision-maker (which Ben Roethlisberger is) and an elusive back with great hands (which Le’Veon Bell is) and if you practice plays from the two-yard line enough (which the Steelers do), you are going to make the two-point play more than you fail. Isn’t the object of the game to score more points than the other team? The Steelers are 15 for their last 22 tries in two-point attempts. That’s 30 points. If the Steelers kicked the PAT in each of those cases and were perfect (no lock there), they’d have scored 22 points. Bottom line: The more you do something—assuming you’ve got good players doing that something, which the Steelers absolutely do—the dumber it is NOT to do it. a. Entering Week 11, the Steelers had lost four in a row—the first against a team (Miami) that had won four in a row entering Sunday, and the next three against division leaders (New England, Baltimore, Dallas) with a combined 20-7 record. b. Tomlin has been an average of four games over .500 in his nearly 10 years as Steelers coach. Chuck Noll was an average of 2.6 games over .500 in his career, Bill Cowher 4.1.
c. Changing coaches because your coach stinks is okay. Changing for the sake of a four-game losing streak … I will bring back this stat from earlier this year: Since 2000, the Patriots have had one coach, and the other three teams in the AFC East have had an average of 7.3 coaches per franchise. d. Not saying history will repeat itself, but I remember going to Steelers training camp in the summer of 2004 and being puzzled by the fact that the Steelers were coming off a 6-10 season, with an ugly playoff loss the year before to Tennessee … and owner Dan Rooney rewarded Bill Cowher with a contract extension. Made no sense after 12 years, with such a bad taste left from the year before. Well, the Steelers went 26-6 over the next two regular seasons, and won the Super Bowl in the second year after Cowher signed the extension. 8. I think, after 11 weeks, and coming off the Cowboys facing Baltimore’s top-rated defense in football, I’m still on the Ezekiel Elliott-for-MVP train. That could change, but that’s where I am now, even after the Ravens limited Elliott to 128 scrimmage yards (which is not exactly holding a guy down). Elliott has a league-high 110.2 rushing yards per game, and 138.2 scrimmage yards per game, 1.1 touchdowns per game. 9. I think it’s worth noting that only one rookie running back in history has even won the MVP. It was called the NFL’s most outstanding player award in the ’50s. In 1957, Cleveland running back Jim Brown won it. And that year he averaged 83.1 yards from scrimmage per game. Elliott’s got him beat—so far—by 53 yards a game. a. Listening to more podcasts these days. The post-election podcast of “This American Life” was just terrific. The segment about two Florida police officers who switched from being pro-Obama to voting for Donald Trump was highly enlightening, as was the incredible segment about emotional parent-teacher conferences the day after the election. b. This San Jose Mercury News story about a high school coach without arms or legs is really inspirational. Nice job by writer Darren Sebedra. c. Sept. 10: In Lawrence, Ohio University 37, Kansas 21.
d. Nov. 19: In Lawrence, Kansas 24, Texas 21.
e. Kansas did not beat Texas. Come on. f. Albert Breer’s favorite coach on the planet, Tom Herman, seems a lock for Texas now. g. Very cool event in my old neighborhood coming on Dec. 2: An evening with Cubs manager Joe Maddon, at the Yogi Berra Museum and Learning Center on the campus of Montclair (N.J.) State University. It’s $175, and includes meeting Maddon and Ken Rosenthal, and a photo with the skipper. Great job by museum honcho Dave Kaplan to get the World Series-winning manager to come to Montclair. h. Beernerdness: Covington Kolsch (Covington Brewhouse, Covington, La.) is the king of German-heritage beer I don’t find often enough—a wheat ale with a very clean finish. Very tasty. There’s been a rise of craft-beer culture in Louisiana that goes beyond Abita, and Covington’s probably the best of the other beermakers. i. Coffeenerdness: I have a history with P.J.’s Coffee in Louisiana, and though it could be stronger for my taste, I was lucky enough to be in a hotel last Tuesday with the regular P.J.’s blend in the lobby—and the smell was overpoweringly good. Sometimes, the smell of a coffee before the sun comes up in the morning is half the fun. j. How masterful is Joni Mitchell, apropos of nothing. What a voice. k. Or perhaps this one. l. I’d rather listen to the storytelling on “The Moth Radio Hour” than watch almost any TV show. The harrowing story of a mom trying to survive and raise a son in a coma without sufficient insurance Saturday was gripping. The Texans are dead last in passing yards, 30th in yards per game, 29th in points scored. Not exactly what GM Rick Smith had in mind when he hitched his wagon to Brock Osweiler for $72 million in March. Thus, give the Raiders tonight, comfortably.